I left the picturesque green of central New York to drive south and west for the beginning of the return trip. We talk about Oregon being green, and the western third is, but rural upstate New York, in the summer at least, offers strong competition in that regard with its intense, almost jungle-like vegetation. Its small towns add a touch of quaintness that makes a visit memorable. 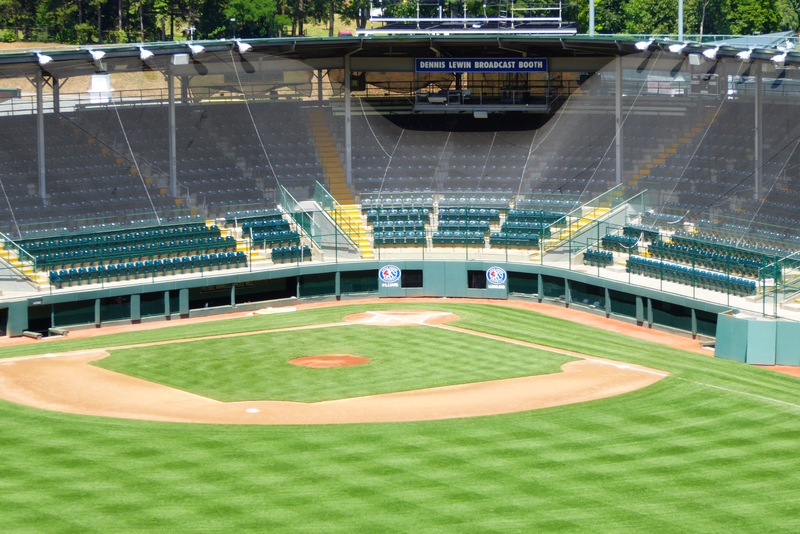 Along the way, I found myself in Williamsport, Pa., home of the Little League World Series. It isn’t going on now, but of course I had to take a picture of the stadium. 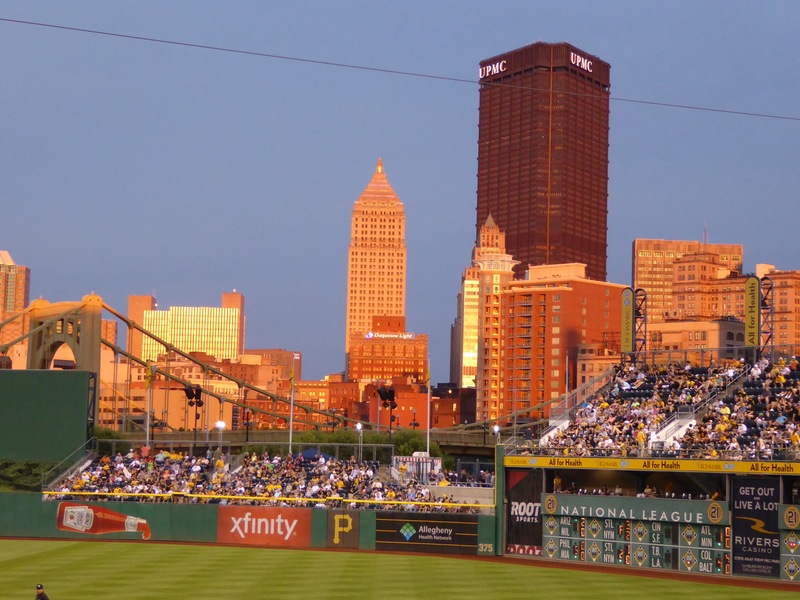 Pittsburgh’s stadium, PNC Park, like Cincinnati’s, sits on the banks of the Ohio River. The view of the river from the park isn’t quite as good, but the River Walk, around the outfield, is lovely. It looks over the river to downtown, which was illuminated by a sinking sun finally escaping a late afternoon cloud cover. It will seat about 38,000 and though not full, there was a substantial crowd for this game. I knew the Pirates would be playing the Mariners, but I hadn’t checked the lineup and thus didn’t realize that King Felix would be pitching for the M’s. I was chagrined that I hadn’t brought my Felix towel with me and actually contemplated going back to the pickup to get it. I needn’t have worried. The anticipated pitching duel between him and Pirates starter Francisco Liriano did not materialize. Liriano walked the first two batters he faced and through the second inning, had thrown more balls than strikes. Felix was pitching home run derby, giving up one to Polanco (followed by Marte’s triple) for three runs in the first, and then was humiliated when he gave up another to pitcher Liriano in the second. 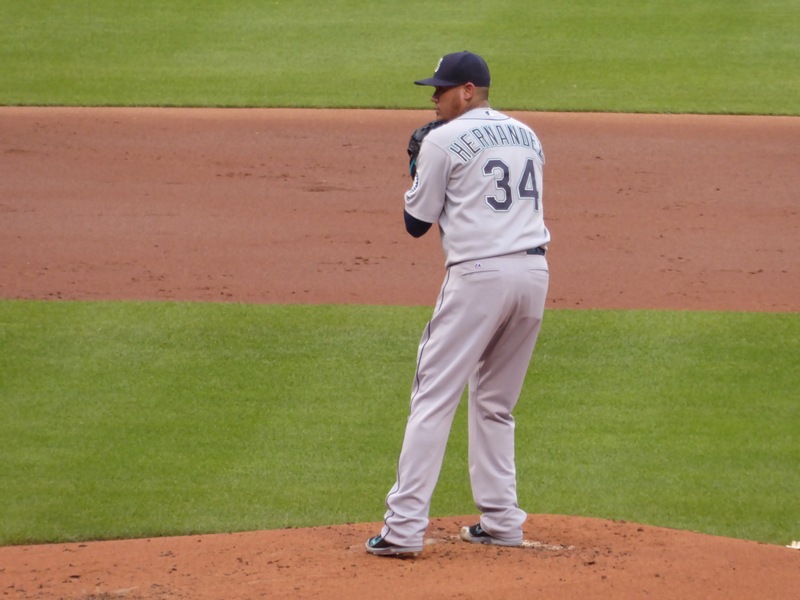 The M’s got a run in the second, followed by their own dingers by Gutierrez in the third and Seager in the fourth, when they chased Liriano and gave Felix a 7-4 lead that he and the bullpen held (though not without drama). I also had the good fortune of a kindly ticket seller who found me a single seat on the 100 level, about 20 rows up from the M’s dugout, halfway between home and first. It really couln’t have been much better, especially for watching Felix. The food at PNC was mostly standard fare and priced accordingly. I chose a pierogi and pulled pork combo, mainly because it sounded unlikely, and it was. The sandwich came with pre-packaged barbecue sauce, but the meat was tender. The pierogis were doughy and uninspired. There was also a decent variety of so-called “healthy” choices, more than I’ve seen elsewhere, and barbecue, reasonably priced but nonetheless avoided. There was even a bargain “small” hot dog at $3. One final note – one of the Pirates relievers is Arquimedes Caminero. If he could team with Socrates Brito of the D’Backs and they could find a Plato somewhere, we’d have a philosophical crew the likes of which have never been seen in Major League Baseball. The weather was cooler than it has been recently, so with the setting, the terrific seat and the M’s victory, it was a very successful start to the road trip home.